*VFL resume control - for the first time since 1978 the night competition was run entirely under the control of the VFL and featured no SANFL/WAFL clubs or state representative teams. *The series with no name - Foster's Brewing, naming rights sponsors of the 1986 Night Series and VFL premiership season, chose not to renew their deal the following year. Negotiations with other potential sponsors were conducted throughout the off-season but proved fruitless. 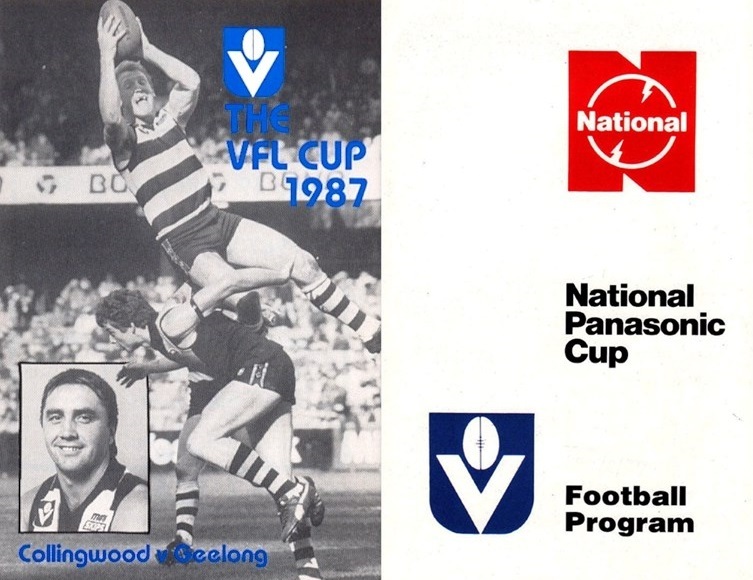 Thus the 1987 night competition commenced on February 17th without a sponsor and was officially named The VFL Cup (see image below right). 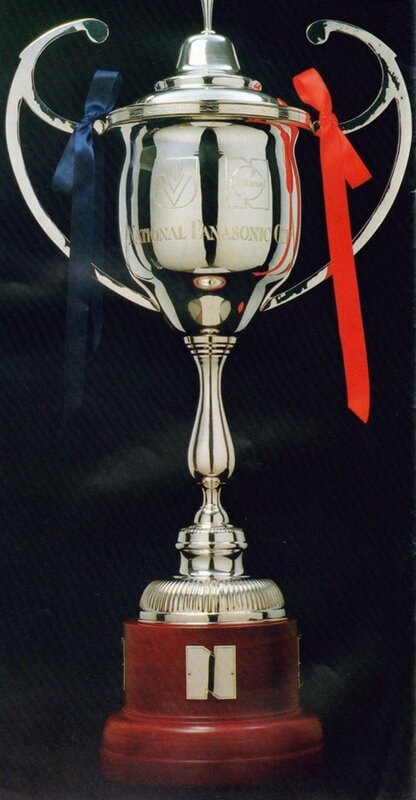 Negotiations continued and by the time of the second match National Panasonic had signed-on as naming rights sponsor for the 1987 Night Series. *Broadcasting shake-up - Channel 7 had been the traditional broadcasting partner of the VFL for 30 years and had telecast all night series matches since the competition's re-launch in 1977. The network approached the 1987 season believing the signing of a new television rights deal would be a fait accompli but the VFL had other ideas, choosing to explore all options before signing a new contract. Although no deal for the 1987 Night Series had been signed, Channel 7 broadcast the series as usual while negotiations over a new television rights contract commenced. Relations between the two traditional partners soon became strained and two weeks before the start of the premiership season the Seven Network announced they were dropping out of the tender process. Shortly after, the VFL announced that production company Broadcom had signed a 6-year, $24.55 million deal. Broadcom then on-sold those rights to various networks in each state which included, ironically, Channel 7 in Perth (other broadcasters were the ABC in Victoria, Channel 10 in Adelaide/Brisbane and the ABC and SBS in Sydney, with Sportsplay, Broadcom's new pay-TV channel, broadcasting games via satellite to pubs and clubs across Australia). Channel 7 had continued their coverage of the 1987 night competition throughout the tender process and, despite losing the premiership season rights, were permitted to finish the series, with the night Grand Final to mark the official end of their involvement with VFL football. These plans were thrown into disarray when strike action by unions at HSV-7 in Melbourne dragged on longer than expected. Network bosses threatened to use non-union staff to cover the night final, the union responded with a threat to disrupt the match by removing all ticket-sellers and turnstile staff from VFL Park. *The move to pre-season begins - since 1978 a handful of Night Series matches had been played in the pre-season each year but the series had always remained an in-season competition, with most matches played midweek during the season and the final being played in July/August. However, as far back as 1979 the need for night series matches to be rescheduled due to one or both teams being involved in VFL premiership matches played on Sundays/split-round Mondays had become a near-annual event. In fact, only two of the eight series from 1979 to 1986 had been free of matches rescheduled for this reason (1980 and 1983). At its worst this fixturing uncertainty had resulted in Swan Districts sending a Colts team in 1982 (then subsequently being suspended from the 1983-84 night competitions) and caused Sydney to play three matches in six days during the 1986 season. With the introduction of two new interstate teams in 1987 and Sunday football becoming a weekly event, the VFL realised the problem would only become worse and the transformation to a series played mostly during the pre-season began. Ten of the fourteen matches in the 1987 series were played during the pre-season and the Grand Final was held in April instead of July. Even with these changes, the final still had to be pushed back from Tuesday to Wednesday due to Melbourne playing a premiership match on the Sunday of the previous weekend. The VFL responded by moving the entire competition to the pre-season in 1988; a move that proved so successful the series remained in that slot throughout the rest of its history. *West Coast's incredible debut - the Footscray-West Coast clash on March 3rd marked the Eagles' official VFL-AFL debut and they had to overcame a slow start before achieving the greatest three-quarter time comeback in series history*. Trailing by 38 points at half time, West Coast held Footscray to just 4 behinds in the third quarter to reduce the margin to 26 points at the final break. The Eagles then piled on 8.7 in the final quarter while keeping the Bulldogs scoreless to claim an improbable 29-point win. *Brisbane's not-so-incredible debut - Brisbane made their official VFL-AFL debut on March 10th at the SCG and the Swans welcomed the Bears to the big league with a 76-point thrashing. the Eagles trailed at three-quarter time by 98 points (17.9 to 1.7), a then-record margin at three-quarter time of a night series/pre-season cup match*. For the Bombers, Nick Walsh kicked 8 goals in this game against the Eagles but his haul proved to be a one-off. Walsh's VFL career ended the following year with just 11 senior games and one goal to his credit. *(this margin was later surpassed in 1993 when North Melbourne trailed Adelaide by 126 points at three-quarter time of their opening round clash at Football Park. The Crows went on to win that game by 147 points; the second-greatest winning margin in series history). *Leading goalkicker - Geelong's Gary Ablett senior kicked 7 goals in the quarter finals against Carlton and went on to lead all scorers in the series with 13 goals (from 3 matches played). *Lucky loser - as with the 1986 series, a fourteen-team competition meant only 7 teams would advance to the quarter finals instead of the required eight so a lucky-loser system was again used. Fitzroy were the beneficiaries this time, advancing as the defeated team with the smallest losing margin (11 points). 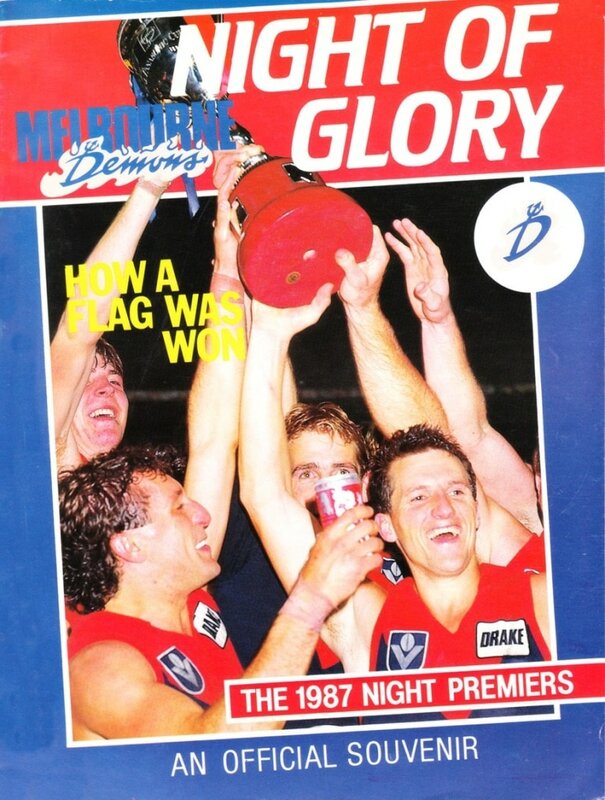 *Dees delighted - the 1987 series is best remembered for Melbourne's nail-biting Grand Final victory over a red-hot Essendon team; a boilover that gave the Demons their first senior trophy since the 1971 Night Premiership and second overall since the 1964 VFL premiership that had signalled the end of their glory era. Melbourne advanced to the final with a series of solid wins, the most impressive of which was their 29-point victory over a powerful Hawthorn team in the quarter finals. In contrast, Essendon started the series with a 43-point cakewalk against lowly-St Kilda, crushed 1986 finallists Sydney by 61 points then demolished West Coast by 108 points in the semi finals. The Demons entered the final as clear underdogs and were missing 11 senior players yet somehow managed to shut down Essendon's high-scoring forwards and turn the match into a defensive struggle. Melbourne entered the final quarter with a narrow 5-point lead it took just eight minutes of play for the Bombers to reclaim the lead, dominating the rest of the final term but unable to capitalise due to a dogged Demon defence that repelled attack after attack. Against the flow of play Melbourne's Bret Bailey snapped truly from a forward pocket and the Dees had managed to steal back the lead with less than two minutes to play. Melbourne were then forced to defend grimly as Essendon continued to attack, sending the ball forward another four times in the last 90 seconds of the match. The siren finally sounded with the ball just 25 metres from Essendon's goal. Melbourne's loyal captain Robert Flower had played 252 games for the Dees without ever playing a final but was forced to miss the decider due to injury. Although vice-captain Danny Hughes led the side in his absence, Flower was later chaired off the field with the premiership trophy (see photo above right). As had been the case for many of VFL football's "cellar-dwellers" in the past, especially during the consolation era of the Night Series (1956-71), the Night Grand Final victory proved a catalyst for greater success in the premiership competition, with the Demons going on an unlikely streak late in the 1987 season that saw them play finals for the first time since 1964 and provided Robert Flower with his first taste of finals football after 14 fruitless seasons. Listed below are match reports for all 14 games played during the series. This is the first time these reports have been collated and published online or in print. Fitzroy later advanced to the quarter finals as the defeated team with the smallest losing margin in Round 1. This was West Coast's official VFL-AFL debut and the Eagles left the crowd stunned with one of the best comebacks in series history. Trailing by 38 points at half time and 26 points at three-quarter time, the Eagles piled on 8.7 in the final quarter while keeping the Bulldogs scoreless. Footscray had absolutely dominated the first half, then scored just four points for the rest of the match. This was Brisbane's official VFL-AFL debut. Hawthorn's Dermott Brereton was injured early and did not return to the field. This match was even more of a massacre than the scores indicate - Essendon led 65 to nil when the Eagles registered their first score... a behind. West Coast's half-time score of 0.1 (1) remains the lowest ever at half-time of a night series/pre-season cup match. The Eagles' first goal was not kicked until the 27-minute mark of the third quarter. Nick Walsh's 8 goal haul proved to be a one-off. 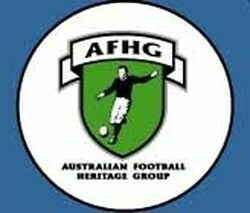 His VFL career ended in 1988 with 11 senior games and just one goal to his credit. Actual line-up not announced pre-match. defeated a red-hot Essendon team. signalled the end of their glory era.